COAXIAL PRESSURIZED CHAMBER Patented since 1992. 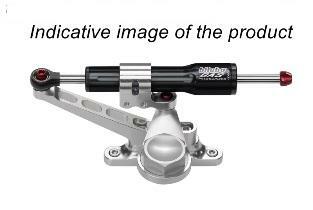 The steering damper increase control of the front end in eliminating the oscillations. It is the particularly useful in riding on very uneven road surface or extreme riding on Track. The steering dampers kit are available complete with the specific clamp kits, ready for fitment on all bikes that are not originally supplied with them, or as alternative to the original damper. The clamps are completely manufactured in aeronautic light alloy and billet with CNC machining. Available for the following mounting positions: “side”, “over tank” (see picture), under instruments or exclusively for racing (without front lighting equipment).